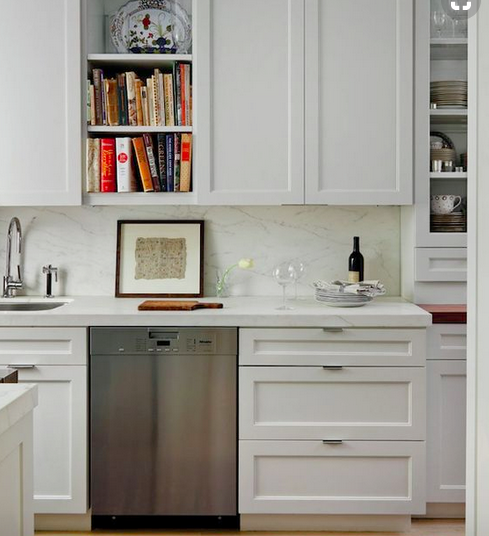 There's a lot to consider when selecting kitchen cabinets. Well, the kitchen plans have been finalized and given a thumbs up with my big ole stamp of approval. We pretty much have settled on a back splash, the counter tops require a road trip to pick out a slab (or two), and I’m thinking about the hardware. But before all of that could happen, I needed to select the cabinet style that we want. One of my main goals for this house is to not be too trendy. Yes, I want to be stylish, but being stylish and being trendy are two completely different things. If I go with something trendy, then it will be something that I can change out easily without too much expense or effort. However, to me stylish means a great look that also will not be here today and gone tomorrow. I have always had raised panel kitchen cabinets in the last two houses and have loved them. This time around, though, I’m going with something simpler. 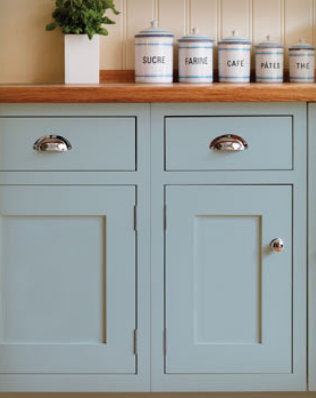 Enter the Shaker style cabinet. Shaker cabinets have straight lines and zero thrills. Plus, they are timeless. After all, they’ve been around since well……the Shakers. (And by the way, a wonderful Shaker Village is located about 45 minutes from where I live, so if you are every making a vacation in Lexington, be sure to put that on your list.) We will use the same cabinets in three of the bathrooms that we use in the kitchen. I like that feeling of continuity when walking through a house, and that’s one way I can get it. (The dorm room bath will get a different/whimsical cabinet, and the powder room won’t have a cabinet at all.) 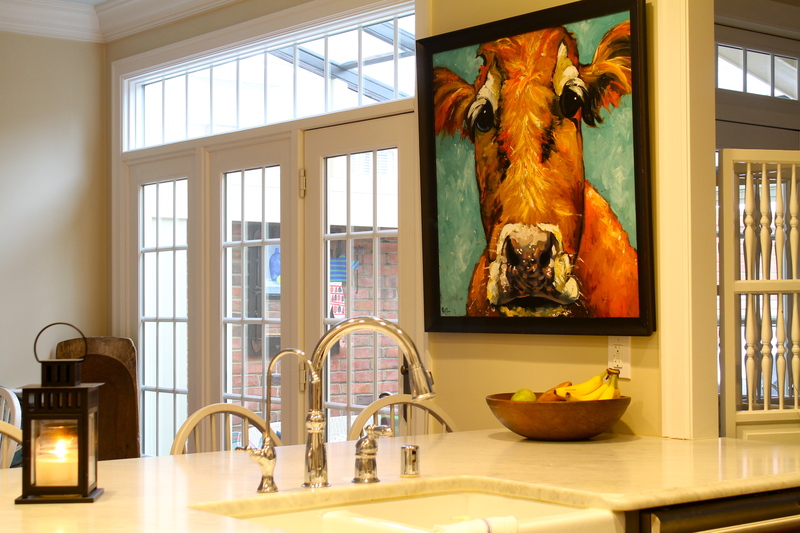 Here’s a shot of Jordan’s kitchen with Shaker cabinets, and she (and I) love them. You might recall that they were originally stained, but we painted them. 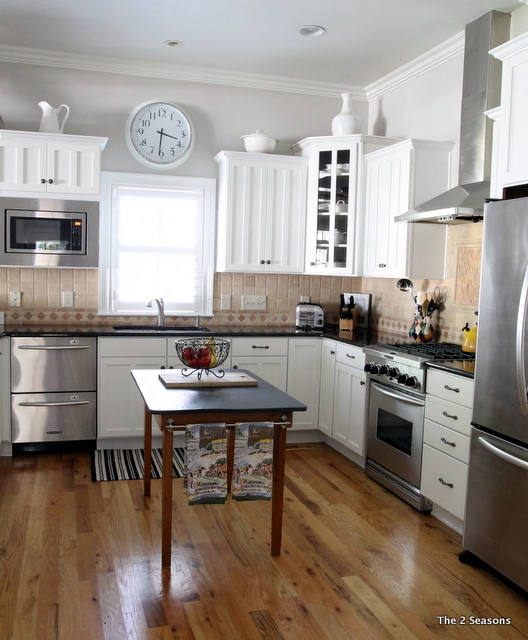 Although they are somewhat simple in design, Shaker kitchen cabinets still require decisions. 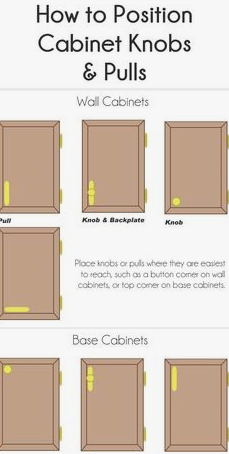 I have noticed that the width on some of the door frames is wider, and on some other styles the frames are more narrow. I prefer the narrower style. The frames on these doors are the wider ones. Some drawers are plain, like Jordan’s, and some have frames around them like these. Which do you prefer? Another consideration is where to put the hardware. So many minor decisions that make a difference when they are put together in a room. I’m not going this route, but look at this kitchen. 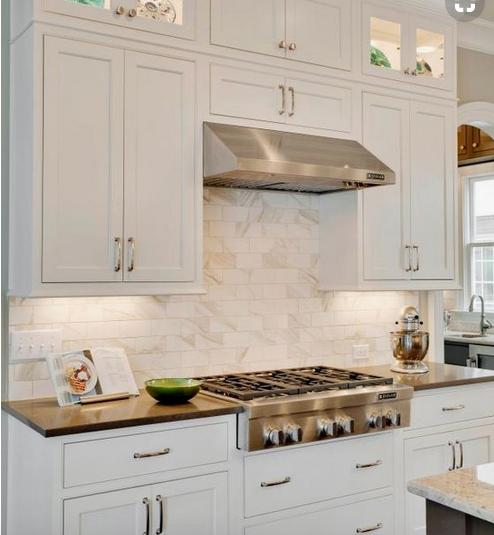 It has Shaker cabinets on the top in white (or is that a light gray) and raised panel kitchen cabinets in wood tone on the bottom. Then there’s a fancy treatment on the glass. There’s way too much going on there for me. See, there was a lot to consider when I was selecting our kitchen cabinets. We still have to pick out the hardware and find that perfect slab of quartz. 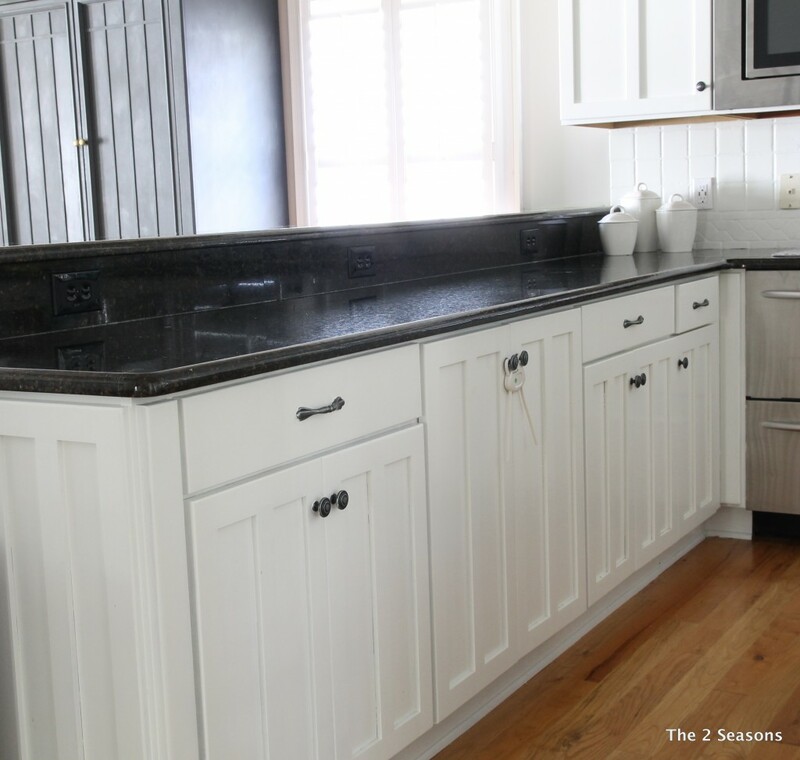 I love my Shaker cabinets and I know you will like them too.They create a timeless beauty and I love the way they look. Your right knobs are can be tricky. I spent a lot of time studying tear sheets I collected for the kitchens I liked, to get the look I wanted. It is Avery detail driven job. Another important consideration is inset vs. overlay. Inset tends to be more expensive and gives a more historical look. 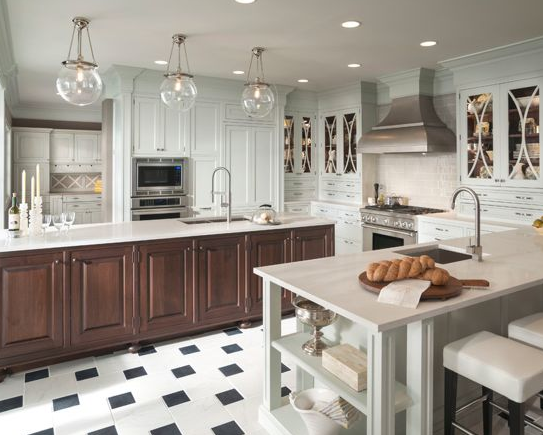 Inset is a very classic, historical and timeless style and very popular where I live in the Philadelphia suburbs. You have good examples of both in your photos. Love your new home.